October 19 – Macon County CASA has been announced as the winner of a $5,000 grant following the Young Philanthropists Giving Circle’s “pitch party” held Wednesday night at the Children’s Museum of Illinois. After painting a persuasive picture of the need for more care options for older children in the foster system, CASA (Court Appointed Special Advocates) emerged from a group of four finalists to win the grant issued through the Community Foundation of Macon County. “We were pleased obviously to make the great effort that we did, to give a presentation that gave a clear understanding of what’s going on with the older children in care,” said Julia Roundtree Livingston, CASA Director of Development who will take over as Executive Director after Steve Miller retires in December. CASA joined other finalists Beautify Decatur, Decatur Macon County Opportunities Corporation and DMH Crossfit Enhance in making three-minute presentations to the more than 60 Young Philanthropists and community members, who then selected the winner. “It’s our own version of ‘Shark Tank’ and a fun, engaging way to get young donors involved early in supporting local organizations,” YP Chairperson Becky Stubblefield said in a Friday media release. “We had over a dozen organizations apply for the grant this year, and they all do great work in the community. 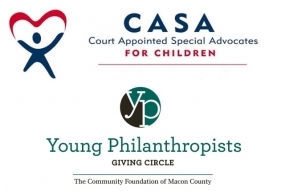 CASA provides court appointed volunteers to advocate for the abused, neglected and/or dependent children who are involved in the Macon County juvenile court system. The agency also works to educate the community regarding its responsibility for children who have been abused or neglected. Young Philanthropists has had more than 100 members since starting five years ago. The pitch party is one of three annual events hosted by the group. The Community Foundation of Macon County serves as a resource to donors, acting as a flexible vehicle for philanthropy. Founded in 2000, it currently manages more than $37 million in assets.